What Is the Oberlo Chrome Extension (OCE)? The Oberlo Chrome Extension is a free automation tool which helps to run a dropshipping business more efficiently. You will need the Oberlo Chrome Extension only if you dropship products from AliExpress. The OCE works only on the Google Chrome browser and only on the computer. It will not work on a tablet or mobile phone. You can install the Google Chrome browser here if you do not have it. You can install the Oberlo Chrome Extension here. Once you open the OCE installation page, simply click on the blue button "ADD TO CHROME". Follow the steps to complete the installation. The Oberlo Chrome Extension icon in the top-right is gray by default, which is correct. The OCE lets you import products to your Shopify store directly from the Aliexpress.com website in only a few clicks. You can find more details in this article. The OCE lets you process orders containing AliExpress products quicker than doing it manually. The whole process is 2 main steps: placing orders and fulfilling/syncing orders. The OCE lets you better sort products by the preferred shipping option on the Aliexpress.com website. This feature has other useful filters too. 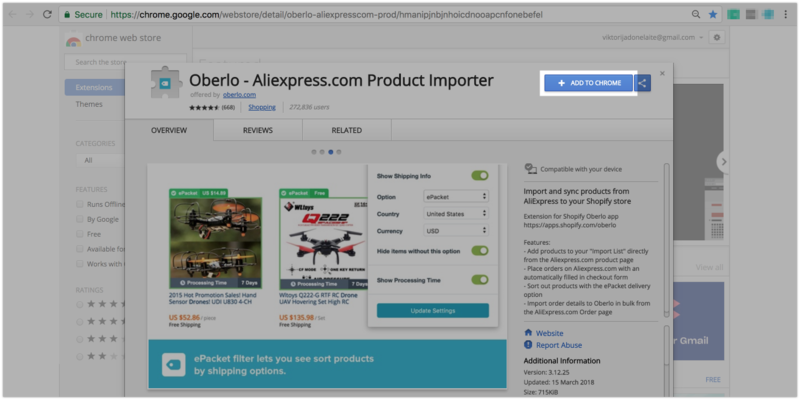 If you face any issues while importing products or placing / fulfilling orders, you should try removing and installing the Oberlo Chrome Extension again.